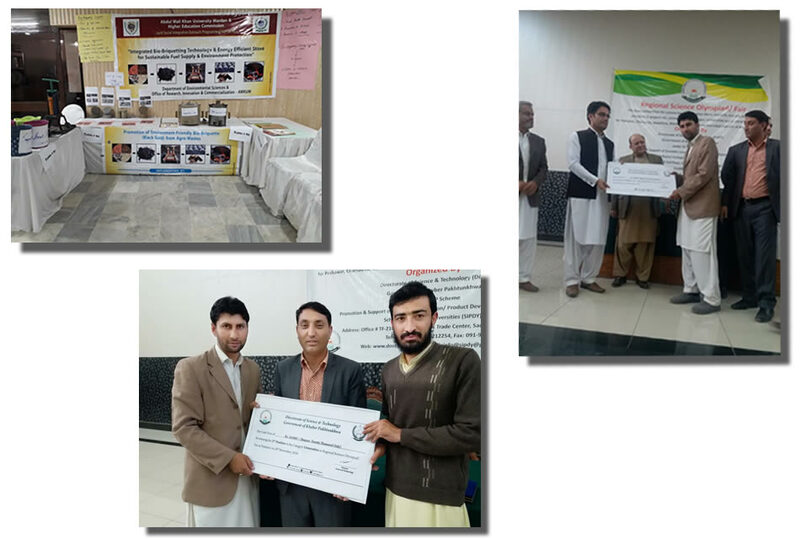 Directorate of Science and Technology (DOST), Government of KPK under its program “Promotion and Support of Scientific Innovation” organized one day open competition for science based innovative ideas, projects and prototypes among universities in KPK. Department of Environmental Sciences, Abdul Wali Khan University Mardan (AWKUM) participated in the event and displayed the findings and product of Mr. Sajjad Ali (MS scholar) project on “Integrated bio-briquetting technology and energy efficient stove for sustainable fuel supply and environment protection”. The project is supervised by Dr. Shams Ali Baig. It is worthy to mention here that the field based project activities are also in progress under the AWKUM-HEC joint Social Integration Outreach Program (SIOP-2018). Over 1000 local community members have been trained; several orientation activities have been organized in Schools and Colleges in Mardan District to disseminate knowledge and hands-on skills on bio-briquetting. In addition, one day workshop for Government Line Departments, NGOs, private companies and entrepreneurs was organized to strengthen networking and promotion of the scientific innovation (i.e. bio-briquette). So, the underprivileged communities get benefits of such prototype and it helps them to improve their livelihoods and promote environmentally sustainable living.